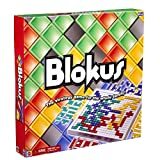 Blokus, pronounced as "block us", is an abstract strategy board game for 2-4 players, created by Bernard Tavitian. The game is played on a 20x20 square board and each player has to fit as many of their tetris-shaped pieces on the board as possible. Each player start to place a piece in their own corner. A new piece must be placed so that it touches at least one piece of the same color, with only corner-to-corner contact allowed. The game is over when all players are blocked from placing new pieces and then the scores are calculated based on the number of squares player's pieces take on the board. When a player could place all his pieces, he can receive 20 bonus points. 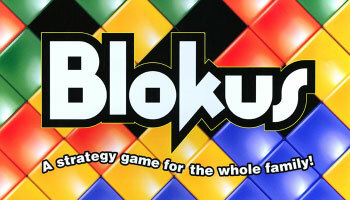 This game develops logic and spatial perception and tactical skills. 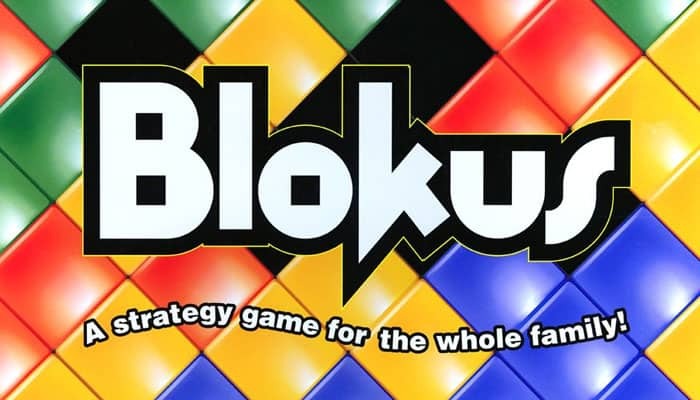 Blokus was first published in 2000 by Sekkoïa. Each of the 21 pieces for a color is of a different shape.There are: 1 piece of only one square, 1 piece of two squares, 2 pieces of three squares, 5 pieces of four squares, and 12 pieces of five squares. 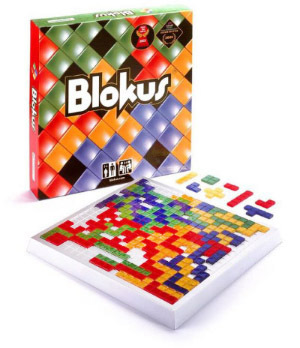 This version of Blokus is the perfect strategy game for two! The simple rules take less than a minute to learn, yet the game has the depth to challenge both beginners and experts alike. 42 game pieces (two 21-piece sets of purple and orange).Note: Each set contains 21 pieces, each a different shape. Game board with 196 squares.Note: The game board has two starting points. The exciting game of three-dimensional strategy! rotating turntable with 100 squares. 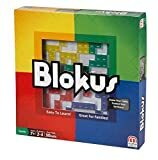 44 Blokus pieces in 4 colors. 4 masks Each of the 11 pieces in a given color has a different shape. 1. Each player chooses a set of 11 pieces, all the same color. 2. Place the turntable on a flat surface. 88 pieces in four different colors (22 pieces of each color). 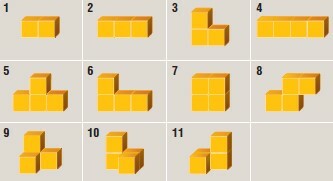 Each of the 22 pieces is a different shape. There are: 1 piece with one triangle, 1 piece with two triangles, 1 piece with three triangles, 3 pieces with four triangles, 4 pieces with five triangles and 12 pieces with six triangles (see figure 1). Each player has to fit as many of his/her 22 pieces on the board as possible.